Hello, everyone! We are so excited to announce our next Urban Growth Seminar, on Tuesday, January 30th! We are honored to bring Mr. Hunter Owens to USC. As a data scientist for the City of Los Angeles, his insight into statistical methodologies and policy-making is exceptional. As greater advancements are made in statistical methodologies, governments run the risk of falling behind and missing opportunities to deliver services more effectively. 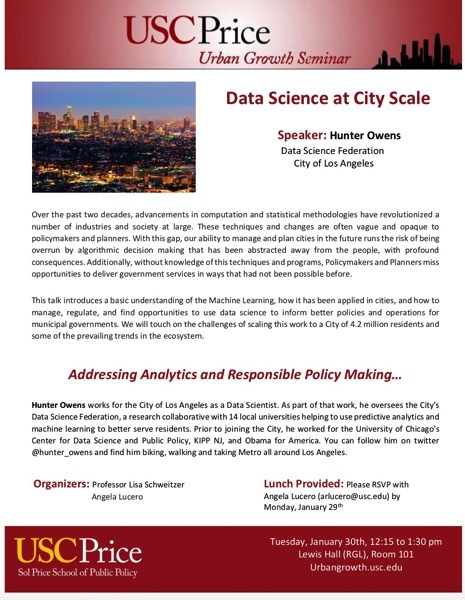 Hunter Owens will share his thoughts on Machine Learning and how to best use data science to inform successful policies and programs without subtracting the human element from responsible policy-making. We will also be serving lunch at this Urban Growth Seminar so please RSVP with Angela Lucero at arlucero@usc.edu by Monday, January 29th. Please see attached flyer for complete details! We hope to see many of you there!